REMINDER: Don’t wear anything nice while frying bacon. It WILL get ruined. I have gone through a lot of shirts… Once the bacon is nice and crispy remove it from the skillet. Add some onion, brown sugar, balsamic vinegar, garlic powder, and pepper to the bacon fat. Then add the bourbon! Bubbly…Yummy. Reduce the mixture down (about 5 minutes). Then Chop up the bacon, and add it back to the bourbon/onion mixture. Put this jam on anything your heart desires. Burgers, toast, eggs, grits, biscuits…You get the point. 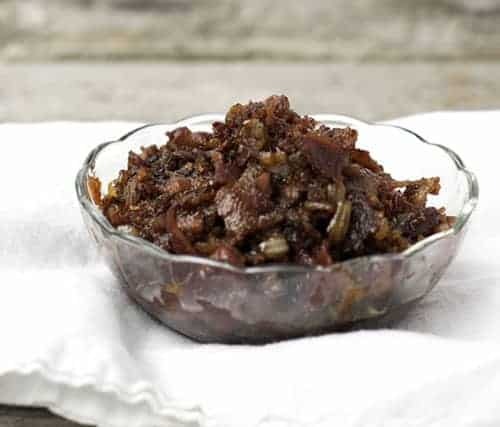 Bourbon Bacon Jam is a great condiment to have on hand. Add some flavor to burgers, sandwiches, or toast. 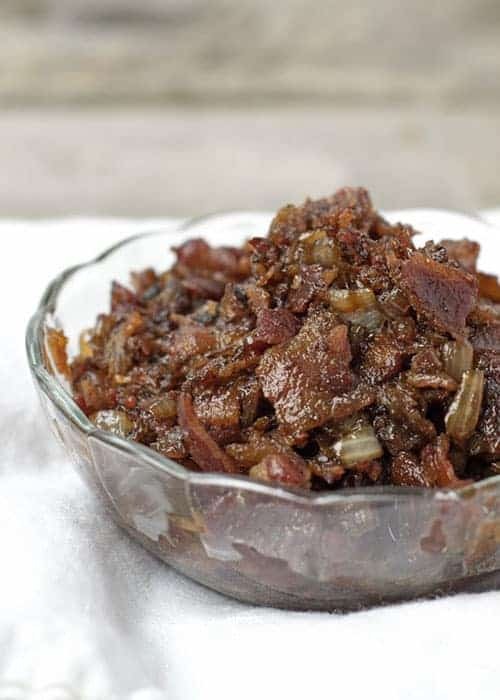 This bacon jam is delicious on anything really. Start by frying the bacon in a large skillet. Fry the bacon until crispy (about 15 minutes, stirring occasionally). 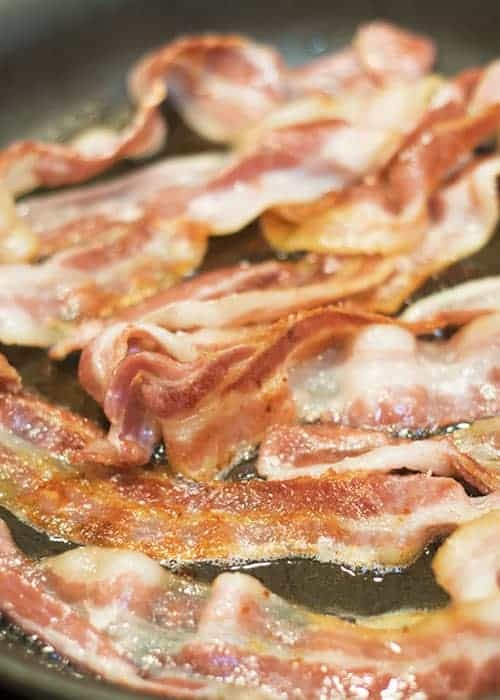 Take the crispy bacon out of the pan and place on a paper towel. 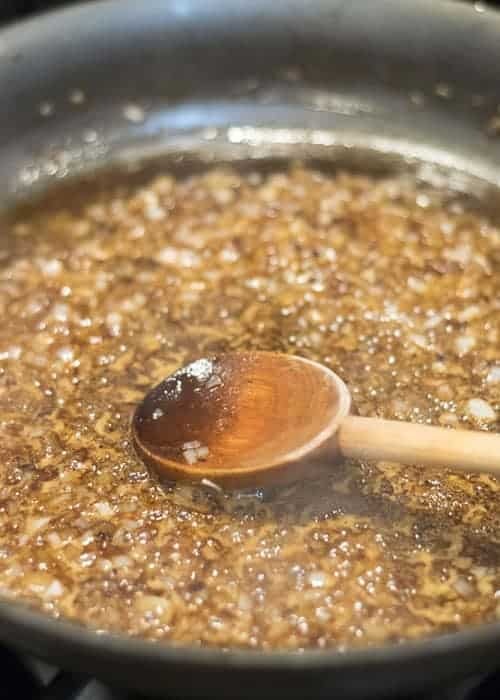 Toss in the finely chopped onion into the bacon grease, and brown for around 2 minutes. Add the brown sugar, garlic powder and pepper. Stir until the brown sugar has dissolved. Then carefully pour in the bourbon. Cook down for around 5 minutes, or until the bourbon has evaporated by half. Chop up the crispy bacon, and stir back into the bourbon onion mixture.